Subtly stylish and sophisticated, this chest of drawers is a chic accent piece that works exceptionally with traditional or modern decor. Smooth case front, beveled edging, and brushed nickel hardware create this timeless fashion. Functional as well as stylish, this chest provides you with five drawers to store clothes, accessories, or lingerie. 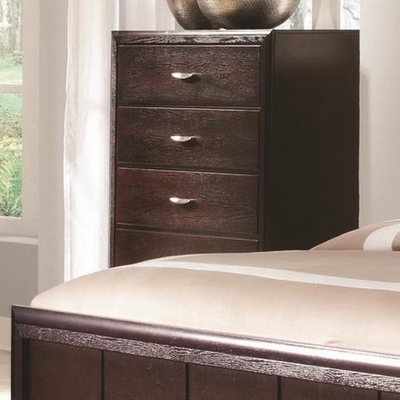 Durable dovetailed drawer construction and metal-on-metal drawer glides ensure your drawers can withstand the weight of your clothing without tilting or falling out.